The first step in realizing the best skin care regimen for your upcoming wedding is setting aside ample time to prepare! You cannot wait a week before the wedding and expect glowing, healthy skin. Are you five or six months away from your wedding? While you’re addressing invitations and picking out bridesmaids dresses, take some time to work on your skin care regimen. Making an investment now will pay off big on your wedding day. A daily routine conditions your skin, maintains healthy hydration levels, and reduces excess oil production. All these factors can reduce the occurrence of spots and open pores as well as flaky, dry and dull skin. Moisturizing daily will also protect your skin from the environmental elements which cause premature ageing (pollution, smoke, UV rays, air conditioning and stress). • A good cleanser appropriate for your skin type in the morning and evening. • Daily moisturizer with SPF. • An exfoliant once to three times a week. Already have a daily skin care regimen? You may wish to have your skin care routine reviewed by a professional if you still have some problem areas. If you have been doing the same skin care regime for the last two years or more, it may need some tweaking because your skin adapts to the products and their benefits. Once your skin gets used to the products, they will not be able to do any more for the appearance of your skin than they are already doing. Are you feeling overwhelmed with all the skin care choices out there? A licensed esthetician will be more than happy to sit down with you for a consultation on what you need to do to improve the condition of your skin. Although the general view of spas and professionals brings up a visual of overpriced shops and botched skin, in reality estheticians provide quality service at a very good price. The price may seem high, but the expense is well worth the savings you’ll receive in the long run. These trained professionals can lead you to what you need; saving you a fortune and keeping you from purchasing items that will not deliver results. Now is also a great time to consider having a professional facial treatment every month. Tell your skin care therapist your wedding date and your skin care goals. They may recommend treatments such as peels or regular facials that will help you achieve picture-perfect skin. As a bride-to-be, you already know the joy and stresses of planning a wedding. While everything else falls into place, it’s time for you to take care of yourself in preparation for the big day. You deserve to captivate guests as you walk down the aisle and be proud of your wedding photos for years to come. Fresh Faced Skin Care offers services tailored specifically to your unique skin care concerns. 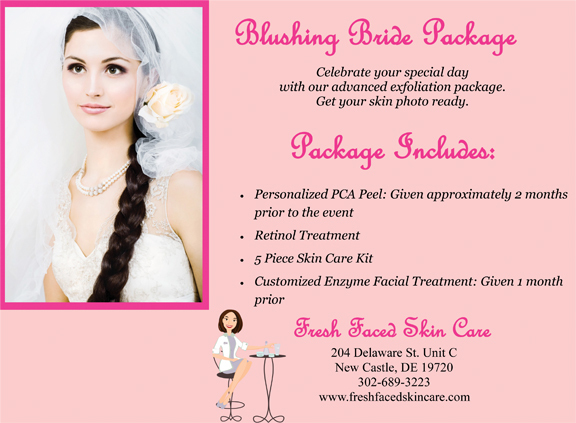 Our Blushing Bride package begins by assessing your specific needs. We encourage brides to bring their mothers and even their bridesmaids – let us throw you a private skin care party! 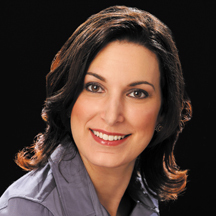 To schedule an appointment, please call 302-689-3223 or visit www.freshfacedskincare.com.